His Excellency Shaikh Mohammed bin Khalifa Al Khalifa, Minister of Oil, opened the Third Gulf Safety Forum on Monday morning, March 25 2019, at the Diplomat Radisson Blu Hotel, where this event is organized by the European Petroleum Consultants company in cooperation with the National Oil and Gas Authority (NOGA) with the participation of senior international experts and suppliers of safety tools and technologies and the latest curriculum, which will help enterprises and industrial companies to achieve these goals in the GCC and the Middle East region. H.E. the Minister of Oil, welcomed the holding of the third edition of the Gulf Safety Forum, and highly appreciated the efforts of the European Petroleum Consultancy company in choosing the Kingdom of Bahrain to hold its outstanding events. H.E. 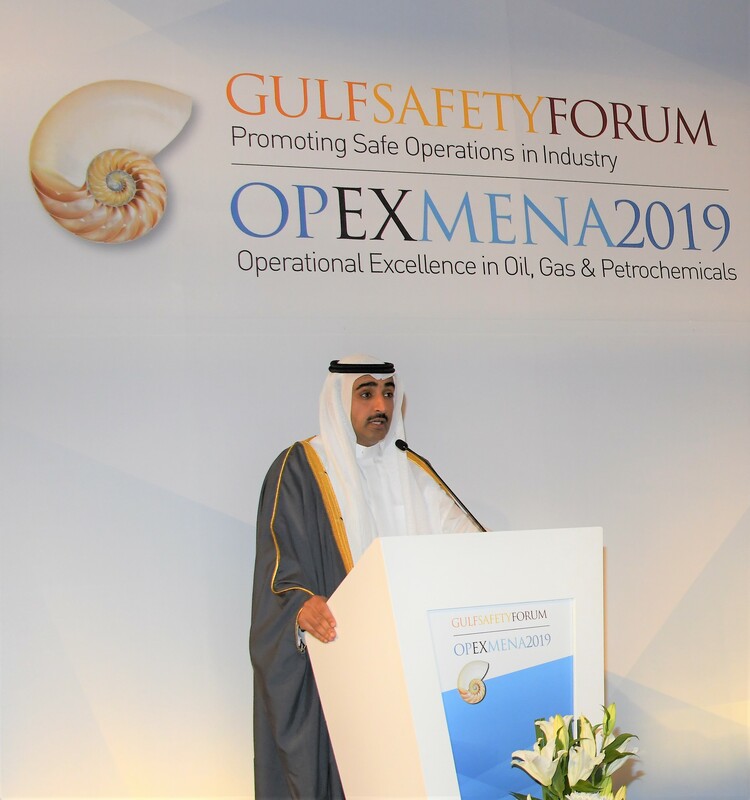 said that the Gulf Safety Forum is a distinctive and important platform for the exchange of experiences, information and perspectives in new and stimulating ways of discussion in order to find appropriate solutions to improve safety in all sectors. In addition to the exchange of successful experiences and the development of a road map towards achieving the goal of eliminating accidents. H.E. noted the importance of placing the issue of safety among the priorities of companies and work to train human labor in innovative and professional ways to be able to contain various accidents, which undoubtedly contribute to reduce losses and waste of time. H.E. the Minister added that the Kingdom of Bahrain is carrying out important oil projects in order to improve the national economy, where these huge investment projects need knowledgeable human cadres in the field of health and safety for the operation of these factories in a safe and high efficiency, and the keenness of the oil companies' subsidiaries of NOGA to review all regulations and laws relating to safety on an ongoing and to achieve achievements in this field. H.E. appreciated the efforts of all employees and contractors of the Bahrain Petroleum Company (Bapco) to achieve more than 20 million hours of work without the occurrence of time-consuming accidents, which is considered significant by the continued commitment to implement the procedures, policies and safety regulations of the company. As GPIC has managed to achieve more than 30 million jobs without time-consuming accidents, which confirms the seriousness of oil companies to implement the highest standards of safety regulations and laws. In conclusion, H.E. the Minister expressed his thanks and appreciation to the organizers, for organizing this specialized and important activities in the field of health and safety in the Kingdom of Bahrain. Praising the themes of this year's forum, which is in keeping with current world events. H.E. also thanked the speakers, participants and supporters, and all those who contributed to the success of this important event, and wished all success for all and benefit from the technical papers presented and enjoy the various experiences of senior experts and officials. H.E. Shaikh Mohammed bin Khalifa Al Khalifa, Minister of Oil, also honored the ARAMCO company, The winner of this year's award for excellence in Safety for companies, which has demonstrated the best overall achievement in the field of safety during the past two years and finding innovative ways to bring lasting improvements to the safety and health of its affiliates, environment and productivity by sharing examples and practical citations in advancing the process of change and promoting best practices in health and safety, which have been evaluated by a committee of experts according to a number of criteria such as management participation, cultural development, performance improvement, and innovation. On the sidelines of the conference, H.E. the Minister of oil inaugurated the accompanying exhibition, in which a number of local, regional and international companies from around the world participated in order to see the latest technology in this field, including Adnoc company, Alba Company, Bapco Company, Enoc Company, Inc. GPIC, Kuwait Oil Company, Quebec company, SABIC, Saudi Aramco, Satorp Company, and many consulting companies.